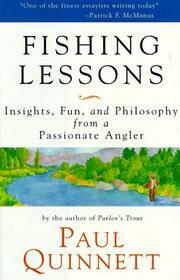 Bland fishing stories that artlessly dovetail into life lessons, from Quinnett (The Troubled People Book, 1982). This collection of brief sketches circles around the “great universal comedy of errors that is angling, and life.— That coy comma is critical to Quinnett’s approach: He may like to “do something crazy once in a while—otherwise life turns into tofu,” but he knows how to wring from each boyish escapade some nugget of timeless wisdom, yessirree, (such as that death is forever or “being close to the things your true heart loves is the surest source of joy”). The Introduction—an ain’t-I-fine, ain’t-I-grand autobiographical snippet in which he actually says his books are “the first books ever written on the psychology of fishing— (is this tongue-in-cheek? aren’t most fishing books just that? )—is the first indication that things are going to get a little self-righteous, with lots of garlicky sermons pushed our way. And true to form, platitudes trip over truisms in the pages that follow. Perhaps YOU didn’t know “that materialism creeps up on you” or that “a fishing trip without laughter is not much of a fishing trip.” Well, now YOU—re the wiser. Quinnett enjoys the notion that as he rumbles toward his sixth decade, he is still a merry prankster—’sound judgement can take an awful lot of fun out of being alive,” and remember that “you may only be young once, but you can be immature your whole life”—though he is never short on judgements and grown-up advice. Nearly every chapter (and there are 90 of them) ends with a horrid one-liner so atrociously trite—”The joy of fishing is not only about catching fish, but about being in places where fish are caught”—you want to kick it. Predictable and forgettable. Readers are advised to go fishing instead.